Exceptional durability in a lightweight package. Light, nimble, and ruggedly built, the M2 Field is a finely-crafted workhorse that represents the backbone of the Benelli® semi-auto line. Designed around the ultra-reliable Inertia Driven® system, it’ll digest anything from 2 3/4” target loads to the heaviest 3" magnums with no adjustments necessary. At 7.2 pounds, it’s perfectly balanced and quick-handling—but durable enough to take the thumps, scrapes, and drops into the mud that come with hard hunting. Benelli’s Inertia Driven operating system incorporates total efficiency with complete reliability. With only three main components—the bolt body, inertia spring, and rotating bolt head—it’s stronger, faster, and never needs to be adjusted to cycle different loads. Gas, smoke, and burnt powder stay in the barrel, where they belong, rather than being channeled into the mechanism. And with no springs, action bar linkage, or gas cylinder under the forend, Benelli’s Inertia Driven shotguns balance like a fine game gun should. Historically, if you wanted less recoil, you had to make the shot charge lighter or the gun heavier. The ComforTech system revolutionized firearms technology by taming recoil without adding weight to the gun. By splitting the stock diagonally and integrating 22 shock-absorbing chevrons, Benelli created a unique stock body that flexes to absorb recoil on its own. The remaining recoil forces are channeled through a soft gel comb insert and thick gel recoil pad, saving your cheek and shoulder from the pounding punishment of full-power buck. Benelli utilizes cryogenic technology to freeze barrels and chokes at -300°F. Such extreme temperatures actually change the metal at a molecular level, relieving stresses caused by the hammer-forging process and creating a smoother surface. CRIO barrels move more consistently shot-to-shot, delivering denser patterns with 13.2% more pellets on target. In addition to more consistent firing performance, the cryogenically-treated bore surface offers less resistance to the wad and shot charge—keeping the barrel cleaner, longer. 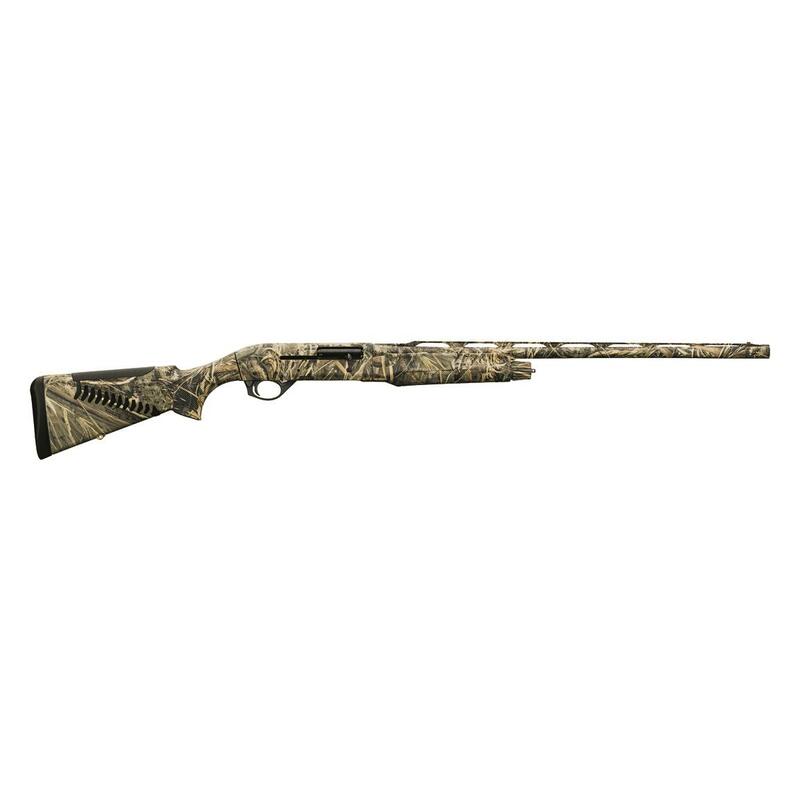 Beretta A400 Lite Synthetic, Semi-Automatic, 20 Gauge, 28"